We are already struggling to tread water in a sea of devices vying for our attention. When connected safety programs are properly implemented, these can be a life raft, and with some work, a speed boat to navigate these waters. The recipients will be honored during next month's American Industrial Hygiene Conference and Exposition. It take place May 20-22 in Minneapolis, Minn. The new board members will be inducted at the association's annual business meeting May 22 at the AIHce EXP 2019 conference in Minneapolis. Safe Work Australia is asking for comments on the draft evaluation reports and recommendations for respirable crystalline silica and respirable coal dust by April 30, saying it will consider them when making final recommendations regarding the workplace exposure standards. There is new scientific evidence that exposure to all welding fume, including mild steel welding fume, can cause lung cancer and limited evidence it is linked to kidney cancer, HSE pointed out in a notice it called a "change in enforcement expectations." HyFlex® 11-818 gloves. Ultralight weight, barehand-like comfort with high durability. 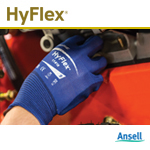 For handling small, fine parts, HyFlex® 11-818 gloves are the ideal multi-purpose glove. The gloves offer a seamless 18 gauge nylon-spandex liner and ultra-thin palm coating for a barehand-like feel, and feature FORTIX™ nitrile patent pending foam and ZONZ® Comfort fit for improved breathability and range of movement. Benefits and uses of IndustrySafe Software. Rugged and reliable, the GasAlertQuattro four-gas detector combines a comprehensive range of features with simple one-button operation. In this 2016 Industrial Scientific video, Scott Jubeck provides an overview of the company's wireless offerings, including iAssign technology and LENS Wireless for Ventis Pro Series Portable Gas Monitors and Radius BZ1 Area Monitors. This 2015 Draeger video case study, featuring the second-largest chemical company in the world, focuses on its use of the Rental Robot, an intuitive on-site solution that uses analytics to help safety managers maximize safety, productivity, and cost savings. This GE Power & Water video posted in January 2014 shows how, in Bogo City, Philippines, electricity linemen have become heroes. Philippines electricity company DESCO President Sherwin Mendiola talks about the need for electricity to support recovery efforts after a natural disaster and to save lives.